Description: Speakers Corner vinyl reissue of a classic jazz album! 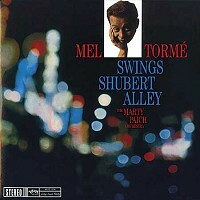 The musical collaboration between the pianist and arranger Marty Paich and the singer Mel Torme was particularly fruitful. Among the dozen LPs they made for various labels, Swings Shubert Alley for Verve is an absolute highlight. This is no wonder, if one takes a look at the old favorites it contains. All are composed by top musical composers ranging from Oscar Hammerstein and Cole Porter up to Leonard Bernstein. Not to forget "On The Street Where You Live" from My Fair Lady. All the song selections come from between 1940 and 1960, and according to Paich, one of the main criteria for their selection was whether or not they had jazz potential. All 12 titles certainly do, and they all offer great opportunities for soloists Art Pepper, Frank Rosolino and Bill Perkins to show off their prowess. One of the best jazz vocal albums of all time! This special audiophile vinyl reissue comes from Speakers Corner Records of Germany. Recorded January and February, 1960. Stereo.